Conclusions: Our findings highlight an unexpected effect in AYAs of color with a history of abuse but no history of depression, suggesting that perhaps there is something intrinsic to this group’s resilience or their support systems that protects both against depression and supports their academic achievement. In conclusion, abuse alone does not serve as a predictor of grade achievement. Further work should be done to determine influential factors behind this relationship, with recommendations for school-based counselors and medical providers to screen for depression along with abuse in AYAs in order to determine how best to support this population. The adverse effects of childhood maltreatment on health outcomes and cognitive development have been studied; however, the impact on educational outcomes remain largely unexplored [1, 2, 3]. Education has often been linked to increased resilience, improved quality of health, and less risky decision making, and studies suggest that it appears to serve both a protective role against abuse  as well as a mitigating role against some of the negative effects once childhood abuse has occurred [5, 6, 7, 8, 9]. While this relationship has the potential to positively shape both interventions and targeted support for children suffering from abuse , studies also suggest that childhood maltreatment and adversity simultaneously act as barriers to remaining in school or achieving higher levels of education [3, 11, 12, 13]. Current research supports that children who have experienced abuse are significantly more likely to suffer from depression, anxiety, substance abuse, and to demonstrate increased risk-taking behaviors [1, 2, 14, 15, 16, 17, 18, 19, 20, 21, 22, 23, 24, 25]. These widespread effects often persist throughout adolescence and adulthood [25, 26, 27, 28, 29], and have the potential to largely impact a child’s educational achievement and ability to partake in and attend school [30, 31, 32]. Therefore, it is often difficult to parse out the association between depression and a history of abuse on the same outcome—educational achievement. While the effects of depression on academic achievement have been studied [3, 11, 12, 13], the compounding effect of a history of childhood abuse on educational outcomes has largely not been explored in the United States, or in youth of color. Our objective, is to examine the role that a history of childhood abuse plays on academic achievement in AYAs of color in order to further unpack the association between childhood abuse, depression, and academic outcomes and to provide recommendations on how best to identify and address the needs of an at-risk population. Our sample consists of adolescents and young adults who were recruited from a population of youth seeking general health services at the Mount Sinai Adolescent Health Center (MSAHC), a primary care clinic designed specifically for the needs of adolescents and young adults ages 10–24 years old. MSAHC provides free, confidential, and comprehensive integrated physical, sexual, reproductive, and behavioral health, as well as dental and optical services. Participants were approached by a research assistant (RA) while waiting to see a medical provider. Participants were recruited with the following inclusion criteria: age of 12–24 years old and able to speak and read English. Institutional Review Board (IRB) approval was obtained from the Icahn School of Medicine at Mount Sinai prior to the data collection. Adolescents received two movie tickets upon the completion of their involvement in exchange for their time and participation. The sample initially included 532 participants who had completed a screening for childhood abuse history. Twenty-six study participants were missing relevant data and were excluded. An additional 30 participants were excluded because they had dropped out of school over 12 months, resulting in a final sample of 476. Participants included in the analytic sample and those excluded because of missing data were similar in all demographic characteristics, covariates, and prevalence of depression (p-values > 0.05). Demographics of our population are provided in Table 1. Baseline characteristics of adolescents who reported having experienced abuse and adolescents who reported not having experienced abuse. Each potential participant was informed during the consent process that any childhood abuse or suicidality disclosed during the research study would be shared with the participant’s medical provider before the participant left the clinic. Participants younger than 18 years of age were informed that if they disclosed childhood abuse, the MSAHC staff members would assess the history in detail and determine the necessary next steps regarding the need to report to Child Protection Services as mandated by law. Once participants consented to being in the study, they were first screened for a history of childhood abuse and, during the same interview, later completed a demographic questionnaire and the Beck Depression Inventory for Primary Care-Fast Screen (BDI-FS) , all prior to being seen by a medical provider. All participants completed the demographic questionnaire and the BDI-FS prior to receiving clinical services, which were then provided by their usual health care provider once the instruments were completed. Abuse: The first covariate was self-reported retrospective history of childhood physical and sexual abuse that occurred before 17 years of age and was disclosed during the face-to-face unstructured interview or of any of the three structured screening methods of the Childhood Maltreatment Interview Schedule-Short Form (CMIS-SF) . The CMIS-SF has been shown to have good internal consistency in adolescent and young adult populations . Questions about parental substance abuse, domestic violence between parents, and emotional neglect of the participants were omitted to shorten the instrument, as these areas were not a focus of study. In the three structured interviews, information about childhood physical abuse was collected through the following questions: “Before you were 17 years of age: did a parent or guardian ever do something to you on purpose (for example, hit or punch or cut you, or push you down) that made you bleed or gave you bruises or scratches, or that broke bones or teeth? Did either of your parents or guardians get so mad at you that they hurt you physically? Did either of your parents or guardians use physical punishment for discipline?” Each question had answer choices of “Yes” or “No.” A participant was considered to have a history of physical abuse if they answered “Yes” to any of these questions. For the face-to-face unstructured interview method, physical abuse information was assessed by asking participants: “How do your parents discipline you? How do they punish you? Do they ever physically hit you?” A positive determination of physical abuse was made if the participant described having been hit, punched, kicked, otherwise struck or pushed down, cut, bruised, made to bleed, scratched, having broken bones, broken teeth, or having been hurt physically. The unstructured interview covered the same issues as the three structured screens but incorporated the possibility of probing and asking other questions as needed. For analytical purposes for this paper, participants were classified into three groups: (1) no abuse history (46% n = 232); (2) history of physical abuse only (29.6% n = 150); and (3) history of sexual abuse with or without physical abuse (25% n = 124). Hereafter, physical and sexual abuse are classified together as history of abuse (yes or no). Depression: The BDI-FS  is a validated 7-item self-report instrument with good psychometric properties developed to assess depression within a medical population. The symptoms measured include: sadness, pessimism, past failure, loss of pleasure, self-dislike, self-criticalness, and suicidal thoughts . Each item is marked 0 through 3 using a Likert-like scale, and 21 is the highest score if the study participant responded with a 3 to all of the items. Zero is the lowest score if the patient answered each question with a 0. The cut points were as follows: 0–3 is minimal; 4–8 is mild; 9–12 is moderate, and 13–21 is severe depression . Scores with ≥4 were recoded as “1”—experiencing depression, and scores of <4 were recoded as “0”—not experiencing depression. The BDI-FS was also used to screen for suicidality. Participants were asked: “What was the last grade that you completed in school?” and given the choices of 4th, 5th, 6th, 7th, 8th, 9th, 10th, 11th, 12th grades and college. The last grade completed was categorized into eighth grade or lower, ninth, tenth, eleventh, twelfth, and college. Study participants’ school performance in the past year was assessed by asking: “In the past year, what best represents your average grade?” Choices given and included in the analysis were: 90–100%; 80–89%; 70–79%; 65–69%; or 64% or lower and was recorded as 4, 3, 2, 1, and 0, respectively. Students who self-reported dropping out of school and not graduating were excluded from the study (n = 30), leaving a final sample of 476. Overall, findings indicated no significant difference between having experienced abuse and not having experienced abuse across all demographic factors. However, nativity status did approach significance (p = .06). Specifically, youth who were born outside of the US reported experiencing abuse far greater than their US born counterparts (62% non-US born compared to 52% US born). To examine the influence of abuse and depression on past year’s grades, a two-way ANOVA was conducted. Residual analysis was performed to test for the assumptions of the two-way ANOVA. Outliers were assessed by inspection of a boxplot, normality was assessed using Shapiro-Wilk’s normality test for each cell of the design, and homogeneity of variances was assessed by Levene’s test. There were no outliers, residuals were normally distributed (p > .05), and there was homogeneity of variances (p = .96). There was a statistically significant main effect for depression, F(1, 472) = 15.97, p < .01, partial η2 = .03. There was a trending main effect for abuse, F(1, 472) = 3.785, p = .05, however, it was not significant below the .05 level, partial η2 = .008. 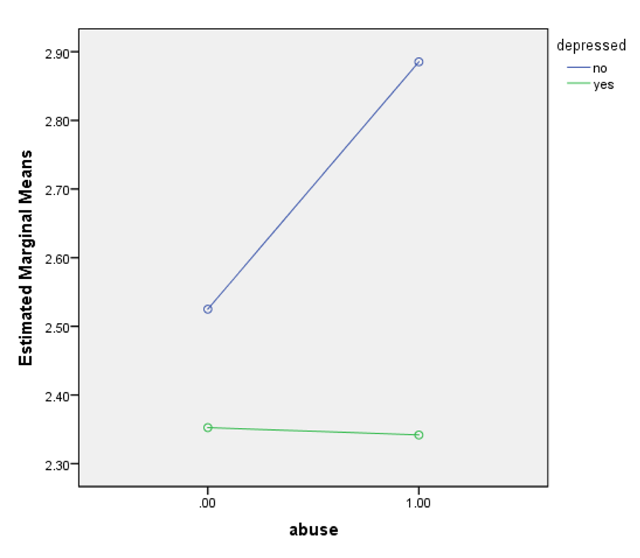 There was a statistically significant interaction between abuse and depression on grades, F(1, 472) = 4.26, p < .05, partial η2 = .009 (see Table 2). An interaction contrast was run that compared the difference in mean grades for depressed and abused youth, depressed and non-abused youth, non-depressed and abused, and non-depressed and non-abused youth. Pairwise comparisons were run for each simple main effect with reported 95% confidence intervals and p-values Bonferroni-adjusted within each simple main effect. Two-way ANOVA considering the effects of abuse, depression, and the interaction term on grades. a R Squared = .040 (Adjusted R Squared = .034). Mean and (standard errors) are reported. Mean grade scores for depressed adolescents who reported experiencing abuse and not experiencing abuse were 2.34 (.06) and 2.35 (.08), respectively, whereas, mean grade scores of non-depressed adolescents who reported experiencing abuse and not experiencing abuse were 2.88(.11) and 2.53(.10), respectively (see Table 3). Non-depressed adolescents who reported no abuse had 36 (95% CL, –.53 to –.18) lower grades scores than their non-depressed counterparts who reported abuse—a statistically significant difference, p < .01 (see Figure 1). Comparative means of grades under the two-way ANOVAL model with the interaction model. * Different alphabets mean significantly different values at a type one error rate of 0.05. P-value (model) < .01. Estimated means by the model with the interaction term (abuse and depression on grades). Our results suggest that a history of abuse alone did not serve as a significant predictor of educational outcomes as measured through grade points achieved; depression alone, in comparison, did indeed demonstrate a significant impact on grades. Youth with a history of abuse and no evidence of depression, however, reported a significantly higher average grade achieved than those with neither a history of abuse nor depression. It is unclear at this point as to what may be driving this finding, however; perhaps there are underlying factors shared regarding resilience in a group of AYAs of color who experienced abuse and yet are not depressed. Studies have demonstrated that positive intervention and support systems can serve to build resilience in youth suffering from a variety of adverse events, and to mitigate known negative consequences for children [37, 38]. Perhaps their lack of depression is a reflection of the support systems in their lives, such as an academic community that serves as an outlet, or intrinsic qualities that have assisted in their abilities to build resilience. In contrast, perhaps these results are a reflection of the variation in measures of abuse, what types of abuse may correlate further with depression, or variation in what is considered abuse by youth in this population. Screening methods attempted to differentiate between corporal punishment and abuse based on levels of physical injury; however, perhaps these findings reflect differences in perceptions of abuse. Additionally, the difference between AYAs of color born in the United States and outside the United States reporting abuse suggests that perhaps there are further cultural differences in definitions of abuse, and therefore the consequences, in this population. Limitations of our study include errors associated with such reliability of self-reported histories of abuse, as well as the varieties in classification of behavior as abuse . Additionally, in this setting, we chose to collapse sexual and physical abuse for statistical purposes, which are often studied separately; neglect was also not studied. We recognize the variances in the impact of those types of abuse, and further work should be done to study those differences more closely. Additionally, we chose to exclude those who had dropped out in order to compare academic achievement by grades obtained. This likely excluded a vulnerable population; however, we were unable to obtain further information as to the reason for dropping out. An additional limitation is self-reported grades, as well as basing academic achievement on only one outcome. Further studies should be done to address a broader definition of academic outcomes in this setting. In conclusion, abuse alone does not serve as a predictor of a minority youth’s academic achievement, and further research is needed to understand how certain youth remain not only resilient to depression but able to excel in comparison to peers without a history of abuse. Educators and health care providers should continue the ongoing supports for those suffering from both depression and abuse, with a sensitive eye for screening and intervention for students struggling academically. Lastly, further studies should address the factors that play a role in increasing the resilience of an otherwise at-risk population in hopes of providing better support systems for future youth. Basch CE. Healthier students are better learners: A missing link in school reforms to close the achievement gap. J Sch Health. 2001; 81(19): 593–8. Freudenberg N and Ruglis J. Reframing school dropout as a public health issue. Prev Chronic Dis. 2007; 4(4). Beck AT, Steer RA and Brown GK. Beck Depression Inventory–Fast Screen for Medical Patients. The Psychological Corporation; 2000. San Antonio, TX. Briere, J. Child Abuse Trauma: Theory and Treatment of the Lasting Effects. Newbury Park, CA: Sage; 1992. Strauss E, Sherman EMS and Spreen O. A Compendium of Neuropsychological Tests: Administration, Norms, and Commentary. 3rd. ed. New York, NY: Oxford University Press; 2006. Whiston S and C Eder K. Review of the BDI-FastScreen for Medical Patients. In: The seventeenth mental measurements yearbook, Plake BS, Impara JC and Spies RA (Eds.). Lincoln, NE: Buros Institute of Mental Measurements; 2003. http://web.ebscohost.com.ezp.waldenulibrary.org/. Institute of Medicine; National Research Council. New Directions in Child Abuse and Neglect Research. Washington, DC: The National Academies Press; 2013.